Click 18 inch Wheel Image To View Complete Product Information And Larger Image. Wagon Wheels, Lower Price, Top Quality Metal Split Hub. 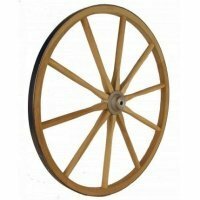 This wagon wheel is one of our smallest steam bent wagon wheels and our least expensive. Small and inexpensive does not mean there is not quality in the construction of this wagon wheel. The wagon wheel hub is solid cast aluminum which can be fitted with a brass bushing for extra durability. 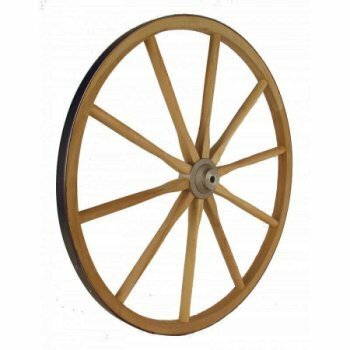 Like all of our wagon wheels, it is made with solid steam-bent hardwood construction and hardwood spokes. All of our wagone wheels have forge shrunk steel rims, this wheel rim is 1/8". These wagon wheels are not only authentic wagon wheels, they can be used to add that rustic, country, or western decor to any room or landscape. Axles and Custom Wagon Wheels: we can make custom wagons wheels up to 14 feet for most any project, for axles and custom wheel prices please Contact Us . NOTE: IF SHIPPING TO ALASKA OR HAWAII, PLEASE CONTACT US FOR CURRENT RATES. We ship orders as soon as the order is completed, however, please allow 14-21 days for delivery. If you need faster delivery, please contact us we will try to accommodate your request.